The town of Wells River on my Green Mountain Division is located on a stub end peninsula and features several sidings with moderate size industries. 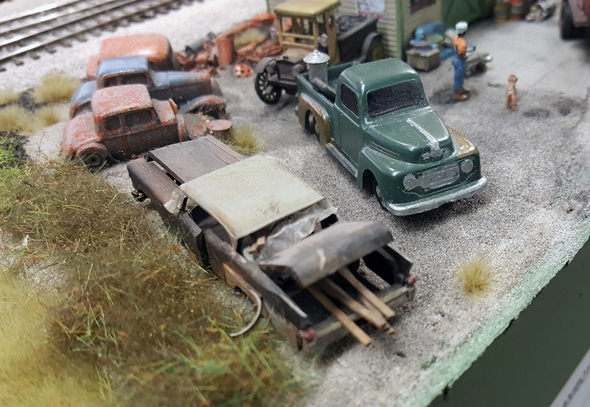 I decided that since I model the 1950's this small town should have an oil dealer to supply fuel for homes, farms and businesses in the area. 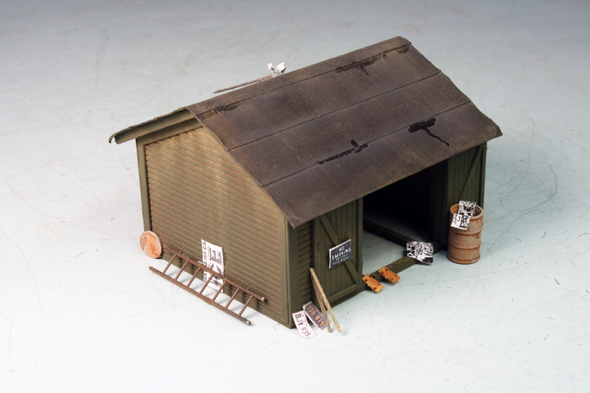 This small oil depot consists of a small wooden warehouse, a pair of oil tanks on metal supports, a truck loading area, four vertical storage tanks for gasoline and diesel fuel and another small brick maintenance shop at the other end of the facility. As far as rail service goes there are spots for two tank cars to be unloaded and a spot at the warehouse for boxcar unloading. 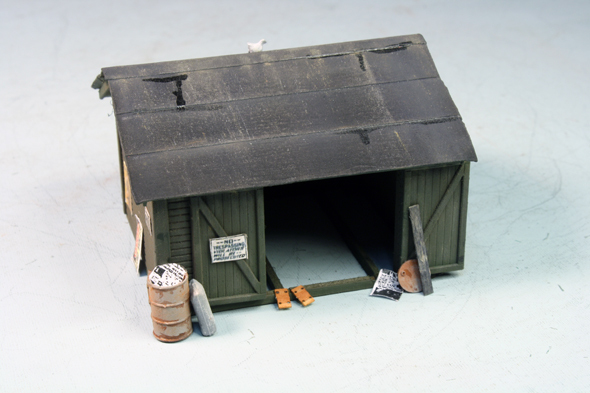 The wooden warehouse was one of two buildings in BEST Scale Models "Elwell General Store" kit and was meant to be a small freight station. I thought it worked very well at the oil dealer for bringing in and storing supplies. 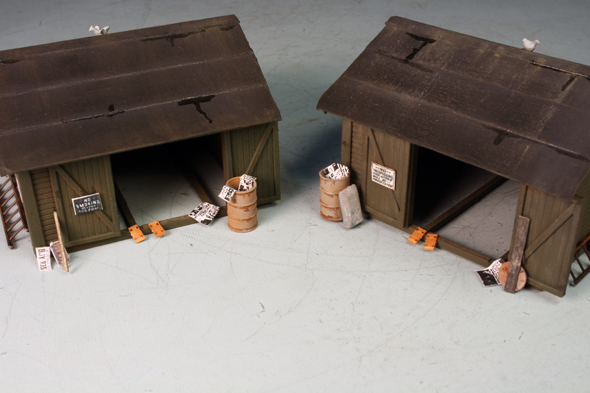 Next to the warehouse is a pair of elevated oil tanks that came from two old Revell diesel servicing kits. I always like these kits and decided that a pair of them would work well in this scene. I added Tichy safety cage ladders and metal walkways to the tanks. 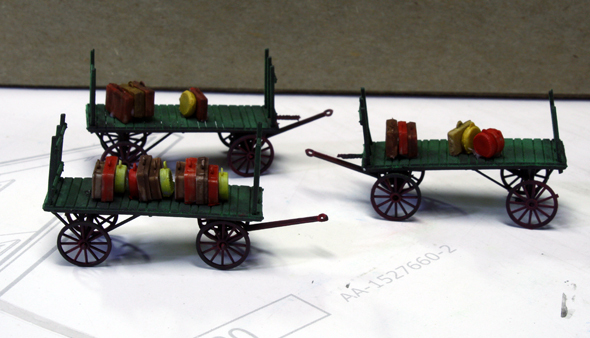 I also added some extra details like hoses for unloading tank cars and loading trucks. 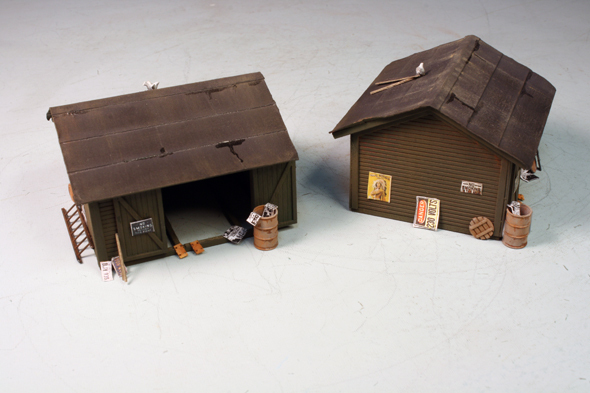 These two Revell tanks worked out quite well here and are typical of tanks found at small oil dealers. Note the Tichy walkways and cage ladders. These two brick building are where trucks are loaded with various products for local delivery. 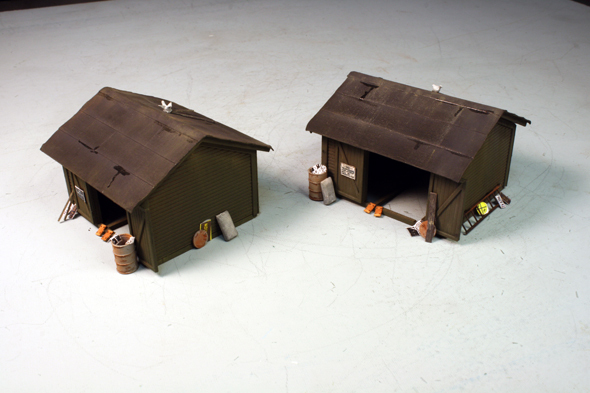 The two brick loading buildings and the four vertical storage tanks are from a Walthers kit. I assembled, painted and weathered these structures to simulate light weathering since they probably haven't been around all that long. They are the perfect size for a smaller oil dealer. This is the back side of the loading are. The vertical unloading pipes were also part of the kit. The large pipes and valves came with a Walthers piping kit. Here you get a little closer look at the drip pans between the rails. I added piping and valves where I thought they might go at a prototype facility. I found a nice Walthers kit with piping, elbows, curved sections, pipe supports and various valves and fittings. The addition of these details help make the scene look more interesting. The four vertical storage tanks are also from the Walthers kit. They come with a cast plastic spill retention dam which I felt took up too much real estate so I fabricated a new wall from square styrene to simulate poured concrete. I feel this looks much better and is more compact in the overall scene. This area is just about complete. 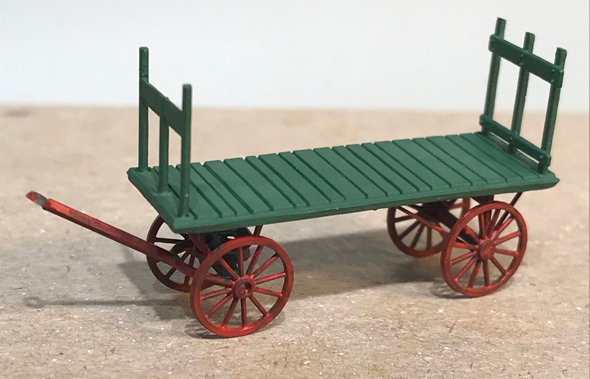 I still need to add some more smaller details but it is ready to receive tank cars of oil and diesel fuel and the odd boxcar of supplies for the dealership. Both B&M and CPR switchers service this facility. This closeup shows some of the piping detail added to the scene. The four vertical storage tanks make a nice addition to the scene and add variety to the various structures at the facility. The brick building in the foreground is a maintenance shop. It is an old Magnuson Models structure. A tank car is being unloaded at the elevated storage tanks. The large cream coloured structure in the background is the Boston & Maine freight shed. Here we see CP 8163 spotting a tank car at Richland Fuels. The CPR SW1200RS was nicely weathered by Jim Sloan. 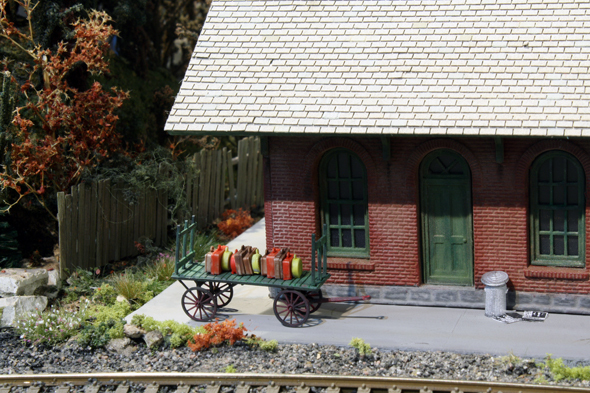 One of many neat looking little scenes on Ken's layout. Not only does the ground views tell a story here is a look above. Kevin is MMR number 528 a nice accomplishment. Kevin had his layout featured in the November 2013 issue of MR. He got a nice copy of the title page signed by the editors that worked on his feature. Kevin added some really interesting detailing to these old junk pieces along the foreground. Some really nice old junk modeled extremely well. Kevin not only works at the RPI he also is a member of the NEB&W. Some of the decals found their way onto his equipment. I have a few of these decals that John Nerich gave me 25 years ago...thinking I should do the same. I bit of inspiration is found here. 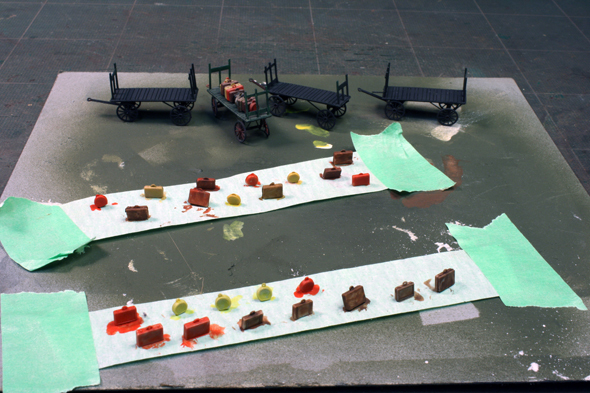 Note that Kevin glued ground foam to the photo background trees making them 3D. Don and Kevin pose at the entrance to the layout. Note one side is one level and the other side double decked. I thought this was a nice little ferry landing area. 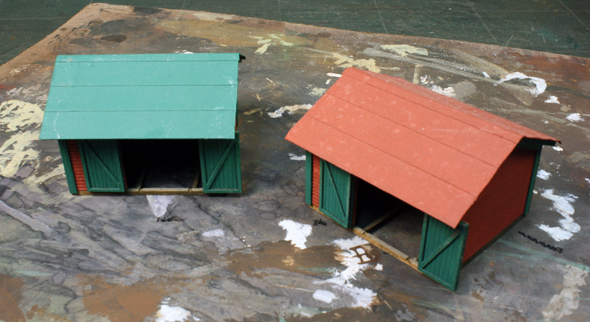 The two motor car sheds are ready for inclusion on two friends layouts. A good number of details really make a difference. Well built from scratch and ready for an upgrade. The roofing is just masking tape but seems to work well on the structure. The base colour for this paint job was a coat of Home Hardware Camo olive green from a spray bomb. The additional colouring on the walls is PanPastel raw umber shade a great weathering colour. Some signs are added. A pigeon and a few board add interest to the roof. The roof is painted black. 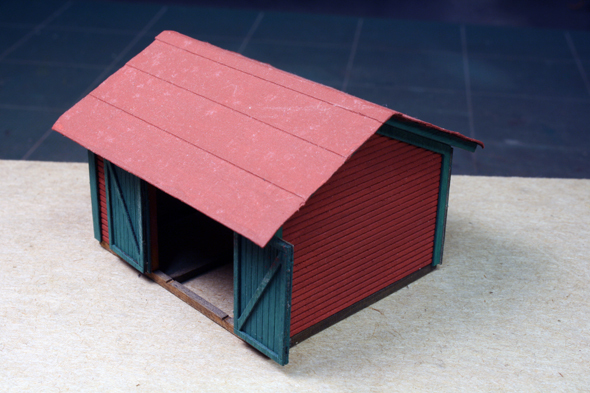 Some roof seams are applied with a pencil then glossed over for seam repairs. Bragdon powders and PanPastel gray is streaked over the roof to finish it off. The barrel and lids are Tichy details. 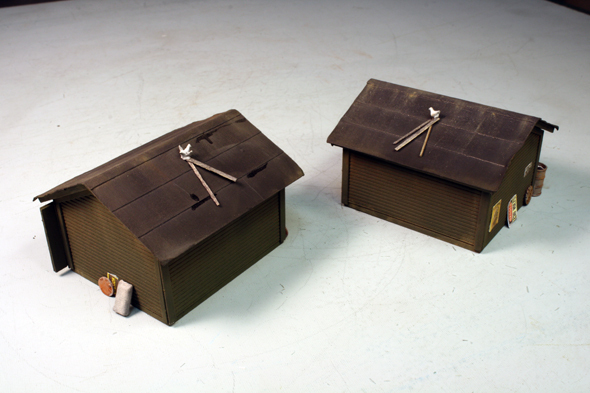 The tie plates are Monster Model Works laser cut wood. Newspapers, signs and boards make up most of the other details. Ken Karlewicz passed along a video he recently uploaded to Youtube called a Sense of Place. It's a 22 minute video combining Ken's use of video and photography which shares his views of upstate NY and Vermont, prototype and modeled. Ken is a true artist and his work is really presented well. You might want to check this one out...thanks Ken. Here’s a shot Geoff Southwood used on this year’s Christmas Card. Geoff allowed me to use it here on the WRD blog. 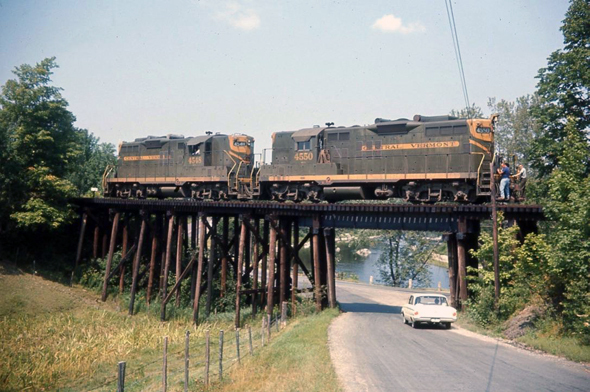 Geoff did not put notes on the original slide, but he thinks it was The Canadian westbound at Pointe Claire QC in 1965 or 1966. Merry Christmas!! 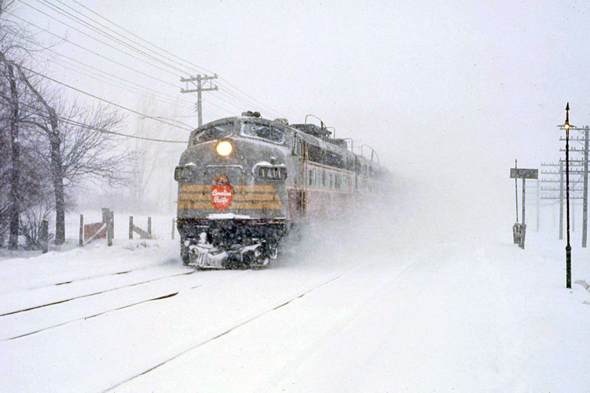 Central Vermont at Richford, Vt. Geoff Southwood photo. 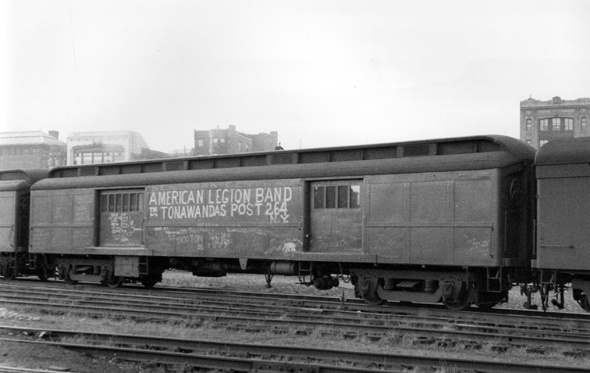 Don Janes collection of baggage cars ready to be deployed on the Green Mountain Route. Don Janes photo. 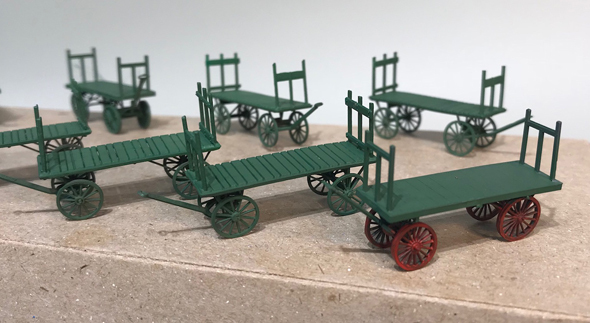 As part of our workday Monday Peter and I assembled three baggage carts and painted the luggage. 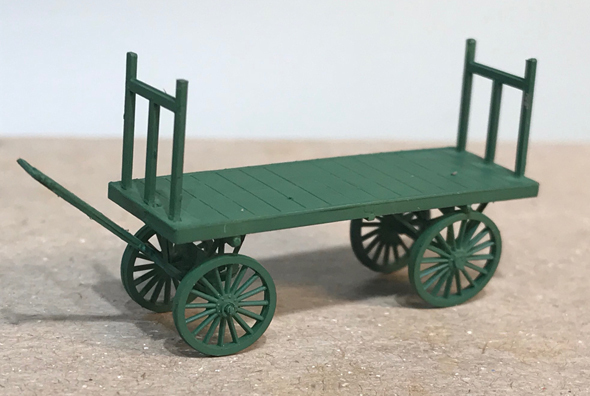 A finished Jordan baggage cart from a past build is seen in the photo. The baggage carts got a coat of flat black from a spray bomb. 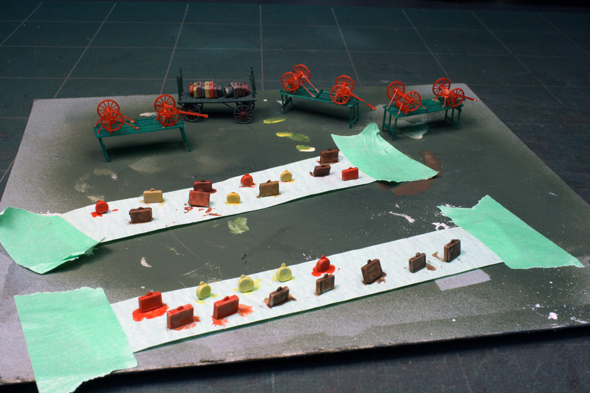 Peter and I used green and red chalk powders to colour our models. This was done in a short amount of time. The baggage was then glued down. Don had a large amount of baggage carts on hand. He decided to build them all at one time in a assembly line process so he could get them out on the layout. Don Janes photo. Don's baggage cart up close. Another look at Don's baggage cart. Don Janes photo. At the White River Jct. station platform a number of baggage carts are seen loaded and ready to go. My most recent baggage cart is at the New Haven station. Throwback Thursday - Root For the Underdog. 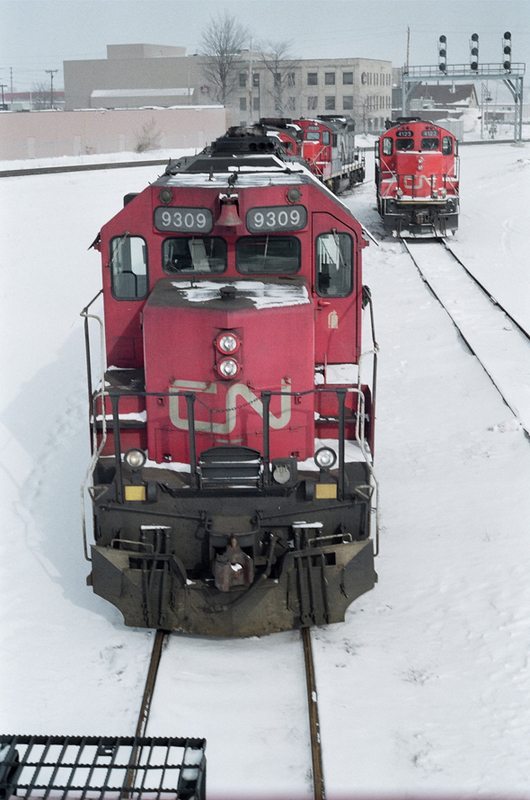 CN 9309 is among friends as it reposes on the shop track at the Rectory Street locomotive facility in London, Ontario on Feb. 09, 1992. I always enjoyed encountering one of CN's GP40 locomotives. Built by GMD in 1966/67, there were originally 16 of these units. They were numbered in the 4000-series, right after the two GP35s. By the time of this photo, 14 of these units remained on the roster, and they had been renumbered into the 9300-series. 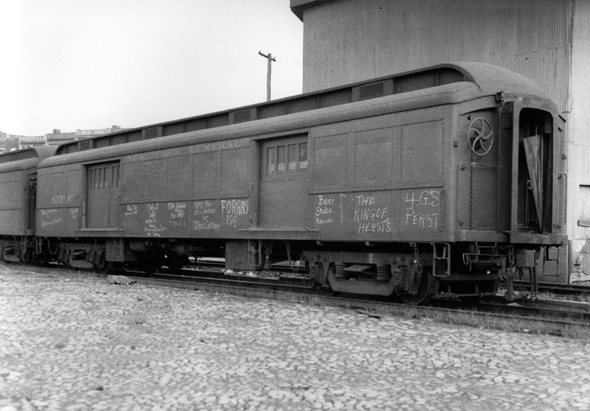 Our subject locomotive would originally have sported number 4009. In 1992, most mainline freights were handled by one or more of CN's ubiquitous GP40-2 diesels, so seeing one of the 9300s in a consist was a bit of a treat. As so often happened as locomotive rosters transitioned from first generation to second, this was actually CN's second use of this 9300 number series. CN 9300-9344 (even numbers only) were CLC CFA16-4 C-Line locomotives, while 9301-9305 (odd) were model CPB16-4. 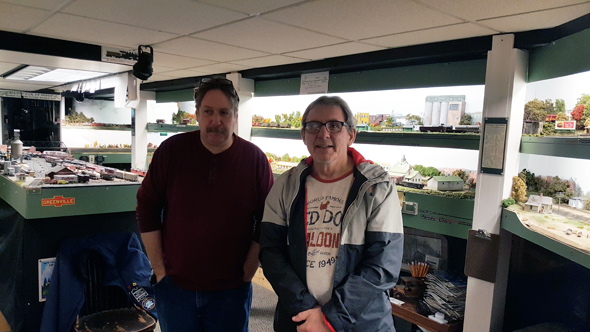 George and I recently attended the Model Railroad Expo in Albany NY. On the Sunday there were several layouts open in the nearby area. 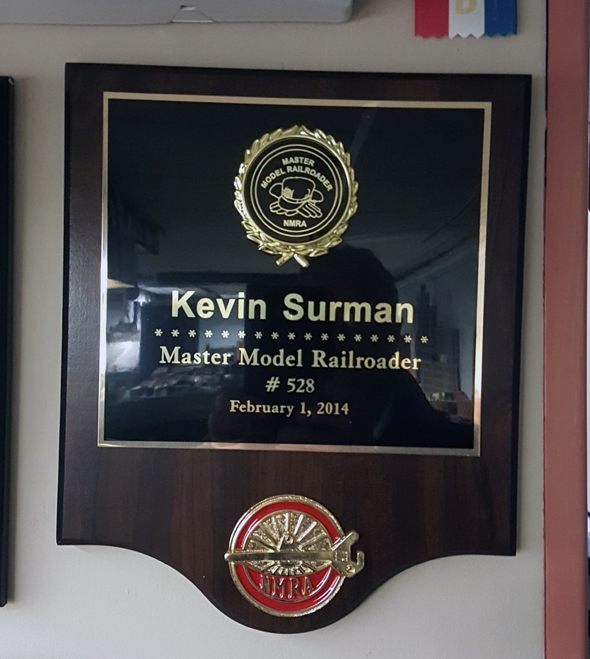 One such layout was owned by Kevin Surman in Saratoga Springs NY. After a stop at the Amtrak Station there to watch a passenger train we headed over to Kevin's house. Once in the basement we saw a large double deck railroad that filled the basement utilizing several rooms. 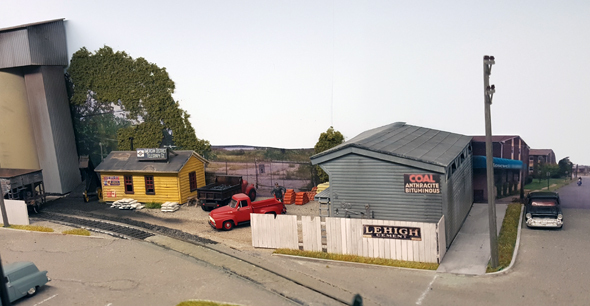 Kevin explained that he is modelling mainline railroad operations in the 1950's in New Jersey which include steam, diesel and electric trains from the Pennsylvania, Central RR of New Jersey and other northeastern railroads. The layout features a fully operational CTC signalling system. .Kevin is the main electrical maintenance man at RPI and says wiring up signal systems is one of his favourite aspects of the hobby and believe me there is a ton of wiring on this layout. Kevin proudly displays his "Model Railroad Engineer-Electrical" Certificate of Achievement on the wall as you enter the basement. 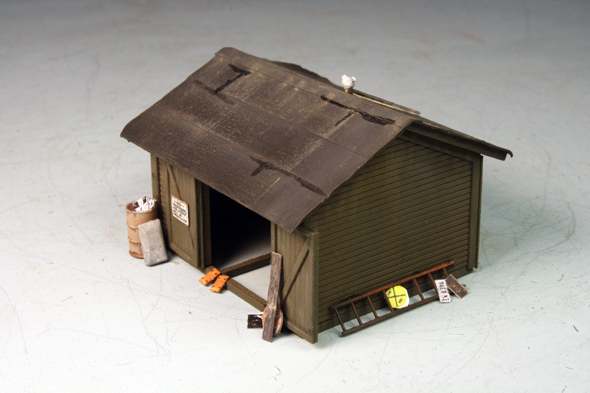 Kevin is also a master at building structures and scenes for the layout. 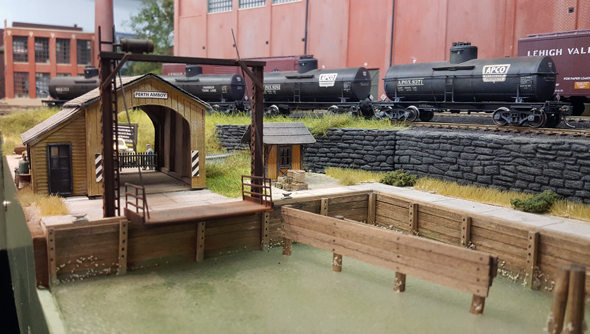 Rather than going on with a lot of text I will share with you some of the great looking structures and scenes that we saw on Kevin's layout. 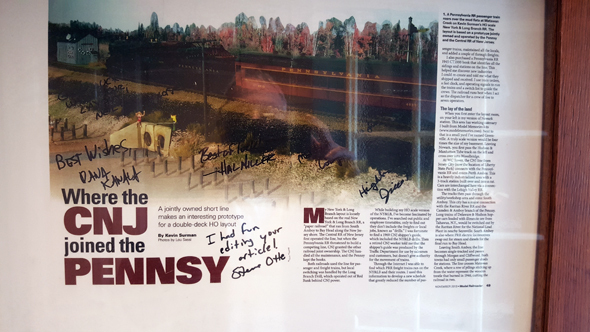 Kevin was a gracious host and told us he was going to tear out a large section of his layout and rebuild it so I am looking forward to seeing it again once he has the new sections finished. Here we see the Newark, NJ passenger station (above) and a set of electric MU passenger cars running under the overhead catenary wires. Kevin has done great job of depicting scenes along the Jersey shoreline, typical of what you would actually see there. 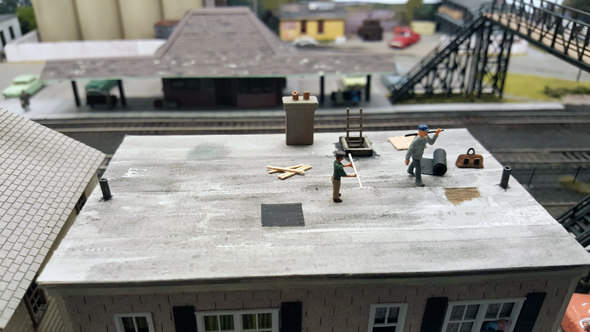 The above three photos show the extent of the detail Kevin has added to some of the many urban scenes on the layout. 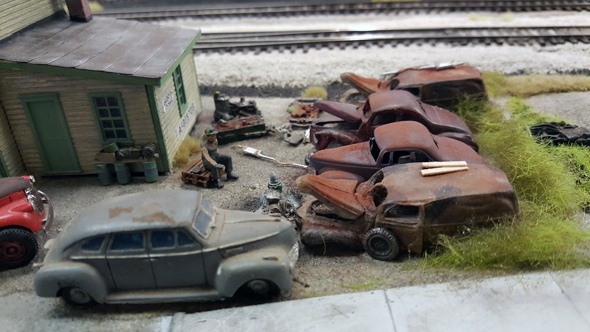 There are a lot of rail served scenes on the layout with many of the structures scratchbuilt or kitbashed by Kevin. One scene that caught my eye was this wooden road bridge. It turns out I built ascratchbuilt a model of this bridge using the same plans Kevin did from an old copy of a model railroad magazine. It really hides the entrance in to another room very well. 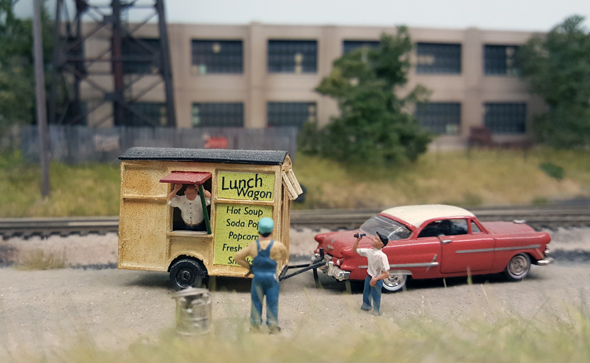 One more industrial scene wit a backdrop of now out of business Sceniking backdrop photos. Throwback Thursday - That's an Oopsy!